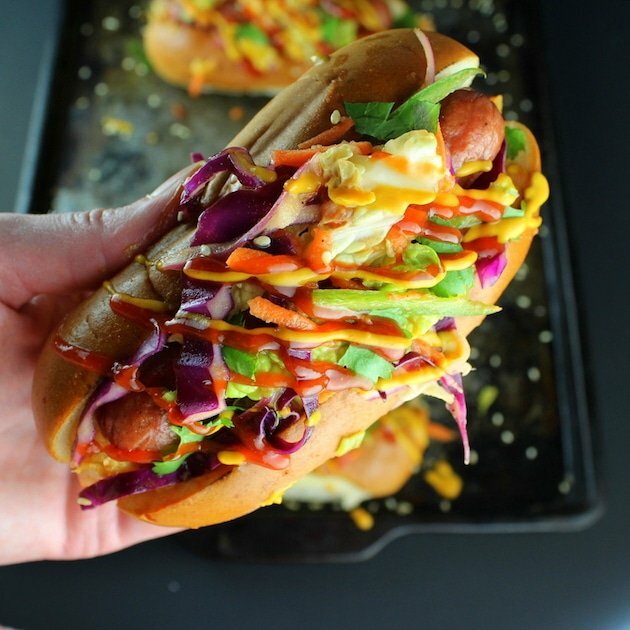 The Korean Slaw Dog … your new favorite Asian fusion crowd pleaser! 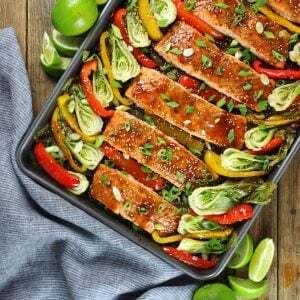 I so love the Asian fusion food trend! 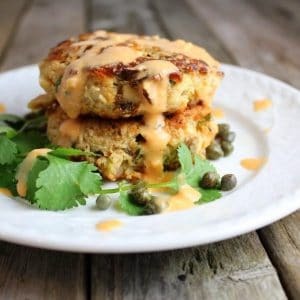 Mixing Mexican and Asian, American and Asian… it’s like many amazing worlds of delicious colliding together creating even more cra-mazing tasty decadence. What did I even just say???? IDK But I do know that this is the best thing I’ve eaten all month. And that’s saying A LOT since I ate some Baked Nutella S’mores last week!! WHOA!? 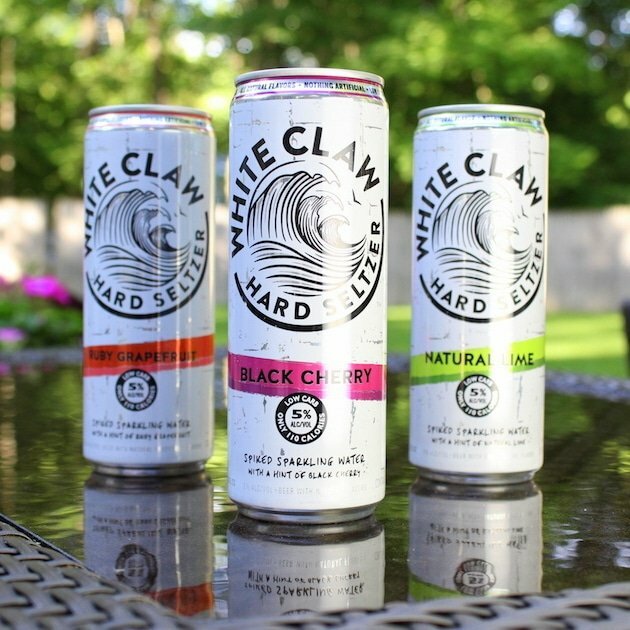 White Claw is an all new type of alcohol refreshment: an all-natural, low carb, gluten-free sparkling seltzer water with 5% alcohol and just a hint of fruit. In other words, the good without the bad.? Sign me up!!? And gimme soma ‘dat!? Let me break it down for you even more my friends: it’s only 110 calories per serving. 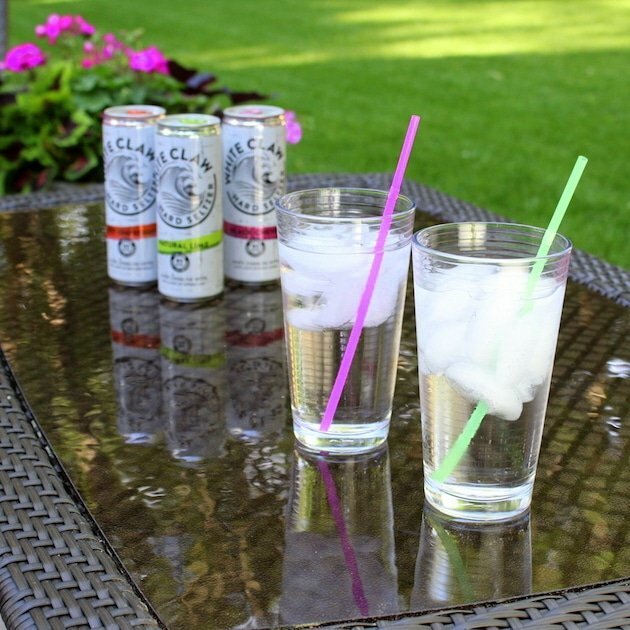 Each flavor of White Claw is made with sparkling water, a hint of natural juice and a touch of pure cane sugar. It contains no artificial ingredients, high fructose corn syrup, or crystalline fructose. AND it comes in three delicious flavors…Natural Lime, Black Cherry and Ruby Grapefruit. Did I mention there’s zero aftertaste!??? It’s like Christmas came early – right!??? 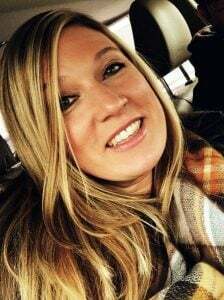 You might be wondering what’s a White Claw? And if you are, I would love to enlighten. First of all because I think it’s pretty cool and because it provides you with some interesting trivia info when you’re serving these at your next neighborhood BBQ. 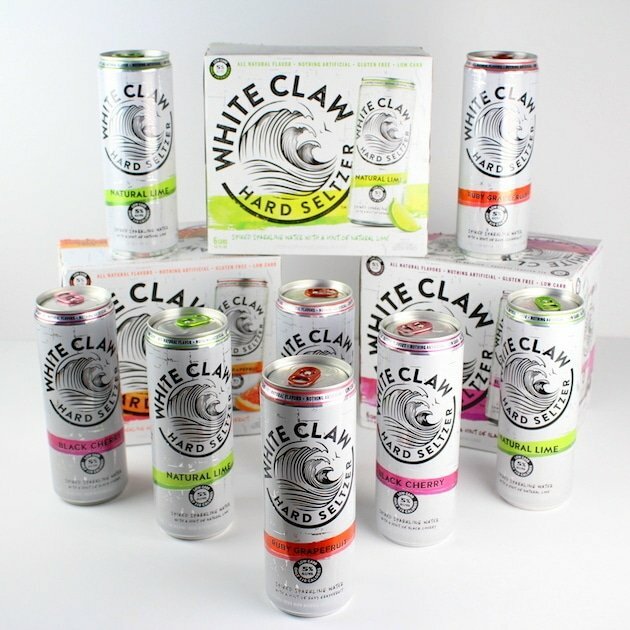 White Claws are freakishly large, big waves that only seem to happen in the ocean when the conditions are just right… dry, hot days when the air is heavy with the promise of a storm. The waves swell in sets of three and then crash, leaving a cool refreshing spray that lingers in the air for days.?? Pretty cool – huh?? This is no ordinary hot dog my friend. But I’m pretty sure you can see that for yourself. 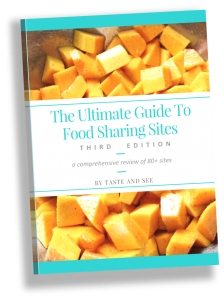 It’s full of Korean BBQ sauces, spicy kimchi, and sweet and tangy Asian Slaw. Not to mention the yummy all-beef grilled hot dog and soft fluffy bun.? Drop the mic and go ahead and pick up one these babies! If you’re thinking this is too good to be true, it is and well, it isn’t! 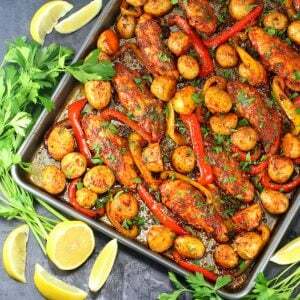 This can all be yours with a few ingredients a little bit of chopping, stirring and grilling.? Here’s what you’ll need to create this masterpiece: First and most importantly a good quality hot dog. Personally I like an all-beef dog. 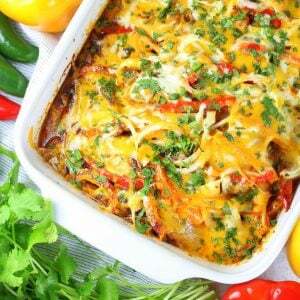 The hearty flavor stands up nicely to all this deliciousness we’ve got going on. Next you’ll need some soft fluffy dog beds, otherwise known as hotdog buns. I like the top sliced ones because they cradle that little puppy perfectly so it doesn’t go rolling out of the bun and off your plate. Plus it just looks much prettier so we’ve got fashion AND function.? You’ll want to either buy some store bought kimchi or make your own. Oh and by the way, I happen to have an Easy Kimchi recipe all ready and waiting for you.? 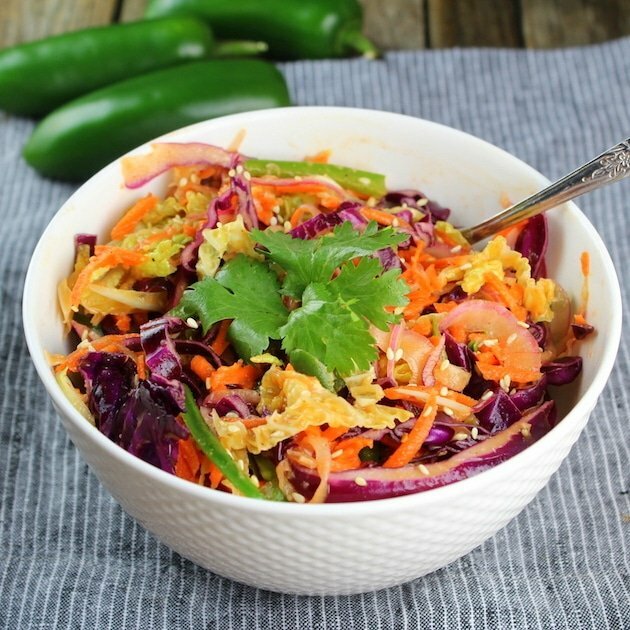 Then you’ll need to get your chop on and whip up some tasty Asian Slaw. It’s basically chopping/shredding/mincing a bunch of veggies…purple cabbage, savoy cabbage, carrots, jalapeño peppers, red onions and fresh ginger. 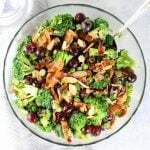 And then mixing together some rice vinegar, extra virgin olive oil, sesame oil, sriracha, dijon mustard, 2 tablespoons brown sugar, salt and pepper for the sweet and tangy dressing.? 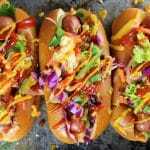 Score your beef franks three to four times on one side, heat up that grill to about 400 degrees and get those puppies cooking. I like to heat up my buns for 30-45 seconds with the cut side down. Now it’s time to assemble. 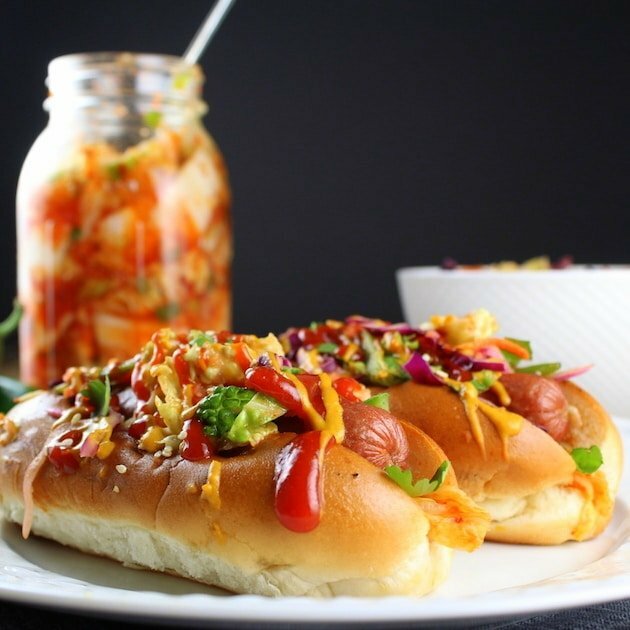 Add the kimchi to the bun first, then the dog, slaw and finally drizzle it all with that delicious zesty ketchup and mustard. And that dog’ll hunt! I think I have to say it’s the best hot dog I’ve ever tasted.? The combination is really incredible if I do say so myself…the grilled smokey meat, spicy kimchi, sweet and spicy slaw and condiments…off the chain my friend. 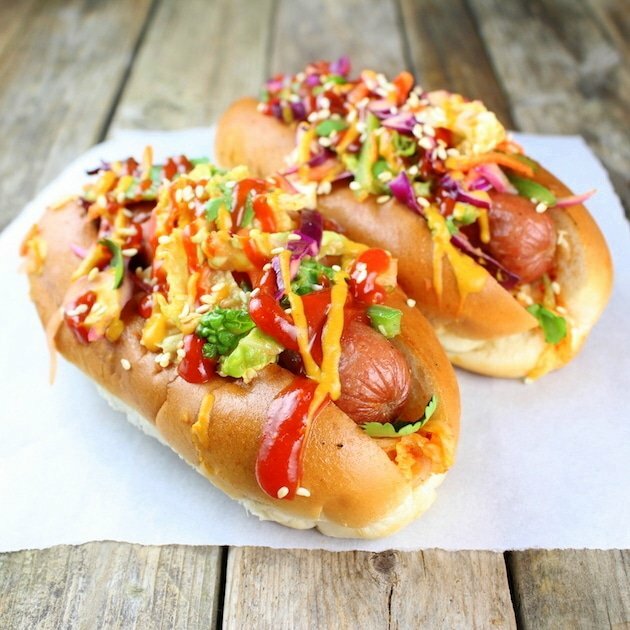 Seriously, the B man was showing no restraint – he put away four of these Korean Slaw Dogs like it was his job. Mmm mmm, finger licking good.? 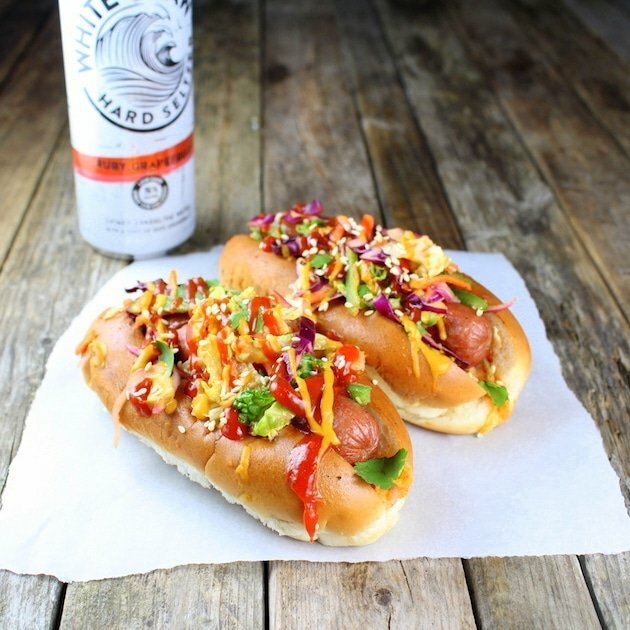 Lucky for you and me, hot dogs are readily available and White Claw is on shelves in grocery and liquor stores right now! 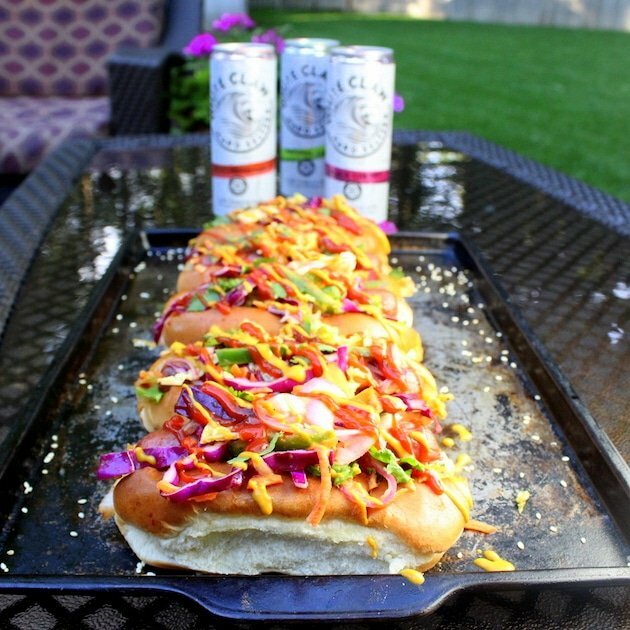 I’m thinkin’ it’s time for a summer BBQ, especially since I’ve basically done the meal planning for you: Korean Slaw Dogs that are a well-balanced meal in every bite, and White Claw Hard Seltzer… a refreshing healthy adult beverage, all pre-mixed and ready to enjoy. What are you waiting for? Text your friends, invite them over ‘cause there’s no time like right now to enjoy all this deliciousness! 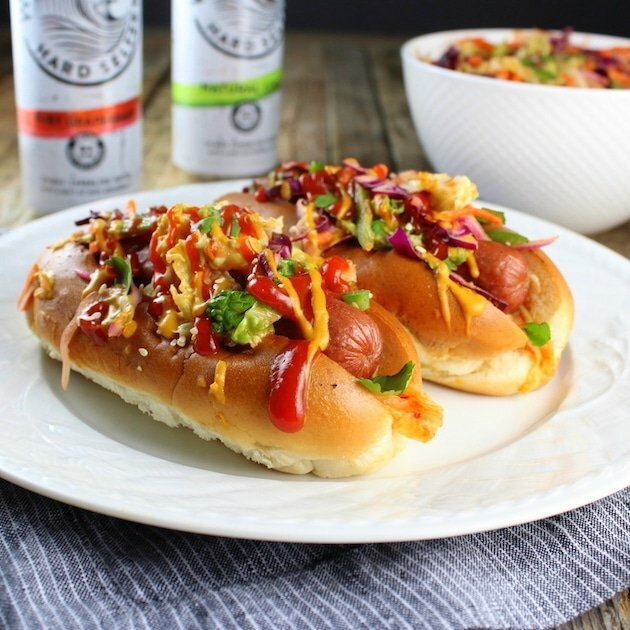 Korean Slaw Dog Recipe: all-beef hot dogs loaded with Korean BBQ sauces, spicy kimchi, & sweet/tangy slaw, topped with kickin' ketchup & mustard. Combine all dressing ingredients in a pint jar, screw on the lid tightly and shake it until mixed together thoroughly. Toast sesame seeds for 2 minutes, until slightly golden in color, and set aside. 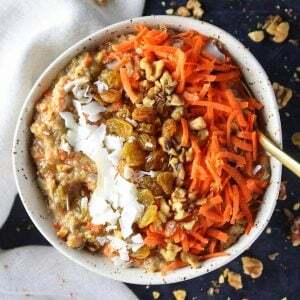 Peel & shred carrots, and add to bowl. Remove seeds & veins from jalapeño peppers, then julienne and add to the bowl. Add thinly sliced red onion and gently fold all ingredients together until well-mixed. 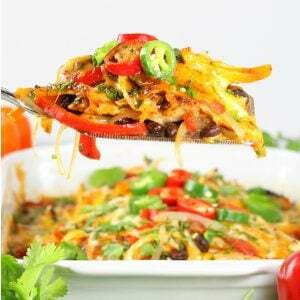 Prior to serving, add the Slaw Dressing to the bowl and gently fold it into the slaw. 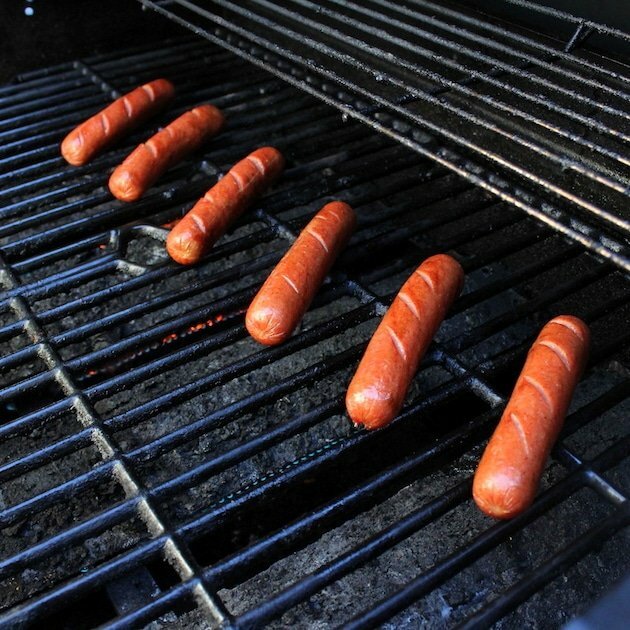 Grill dogs for 8 minutes, rotating every 2 minutes (this will allow hot dogs to heat thoroughly without over-cooking or drying out). 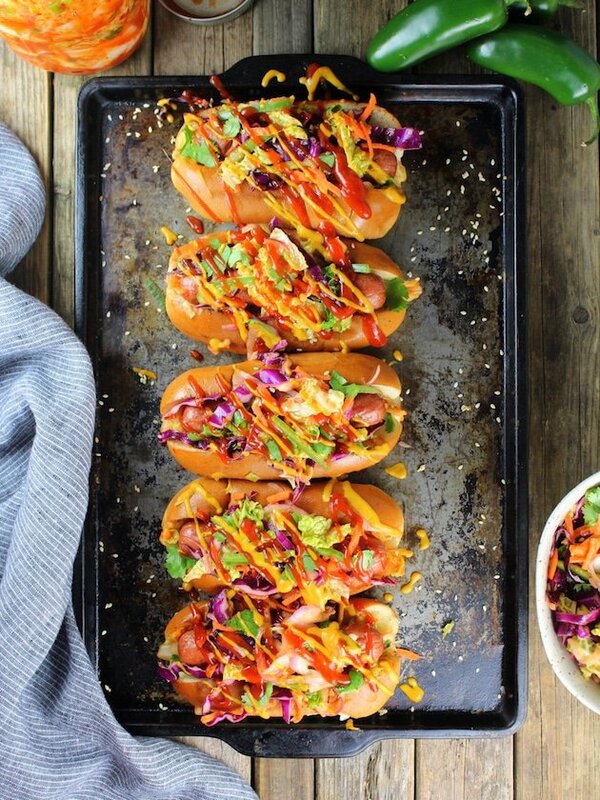 If desired, toast hot dog buns, cut side down on the grill for 30-45 seconds, watching them closely. 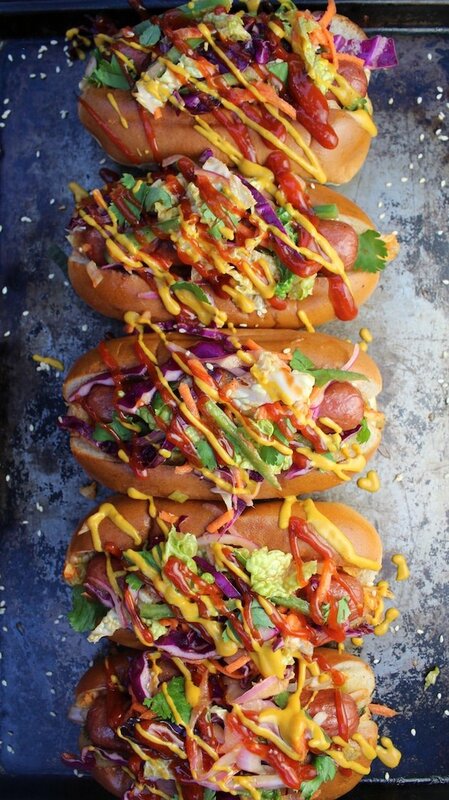 Place 1-2 ounces of kimchi in each bun, then the hot dog, then top with Slaw. 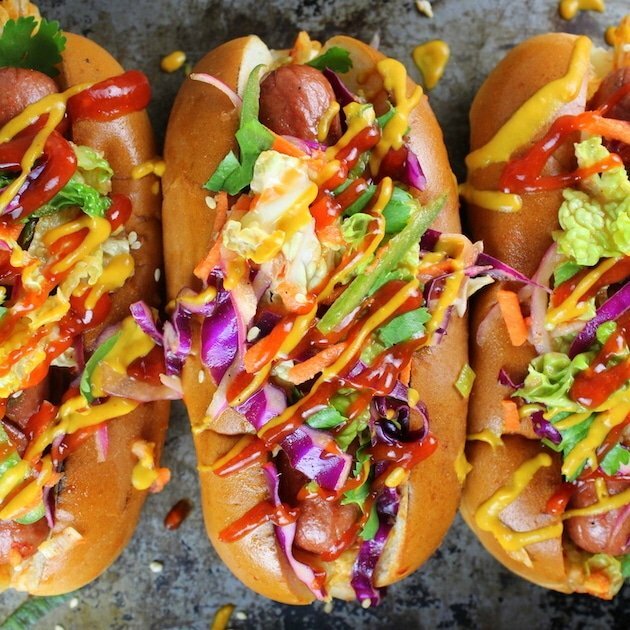 Drizzle the dogs with Kickin' Ketchup and Kickin' Mustard, and serve warm. The pictures are amazing to begin with. Seems like a lot of preparation though. But the final product looks really delicious. Just made these! Made them a little spicier and used a little bit of mirin in the slaw dressing, but stayed fairly true to the recipe and they came out wonderfully! Yayyy! I love that, Jake! 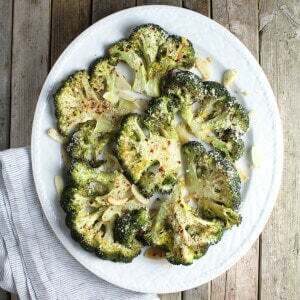 This recipe is near and dear to my heart! I absolutely love it, and love hearing that others share my affinity for it as well. Thanks for taking the time to report back about your experience.